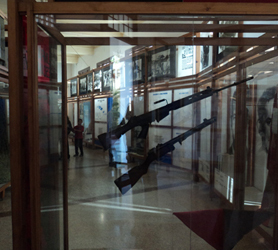 Since 1986 the National Museum of the struggle against what the Castro’s call “Bandits” has housed photos, maps, weapons and other paraphernalia relating to the fight against the various counterrevolutionary groups that operated illicitly out of the Sierra del Escambray Mountains between 1960 and 1965. The museum provides the visitor with a much synthesized account of relevant facts in the struggle against counterrevolutionary elements that attempted to destabilize Cuba form their base in mountainous zone of El Escambray mountains. It is housed in the building of the former convent and church of Saint Francis of Assisi. The fuselage of a US U-2 spy plane shot down over Cuba is also featured. From its bell tower, visitors can enjoy a beautiful panoramic view of the city of Trinidad.